Ready for some back yard bar fun? 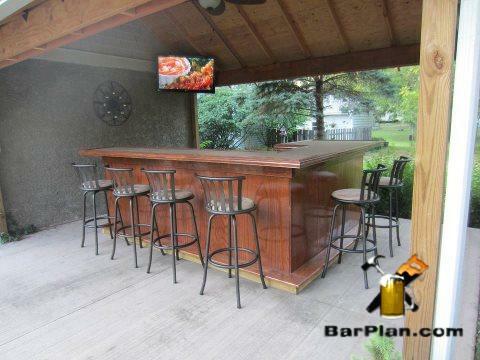 We have a great selection of complete home bar projects that you can build both indoors and outdoors. 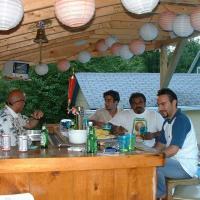 Summer is a great time for the outdoor variety. 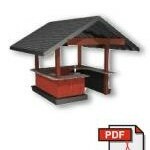 Even our indoor models can be built outdoors, either in the open or under a protective roof or shelter as shown at right. 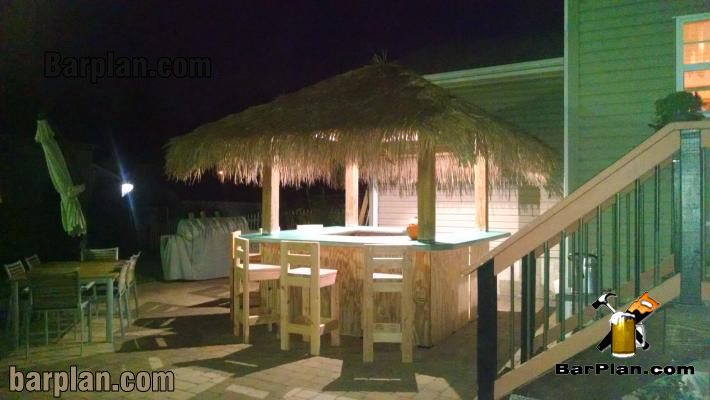 If you want the ultimate backyard bar, you can build our EHBP-20 Tiki Hut Party Bar project that includes an easy to build wide gable roof to protect you from the elements. 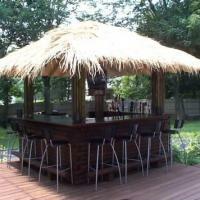 Roof can be modified to a hip style and covered in shingles, tiles or even thatch for the real tiki bar look. 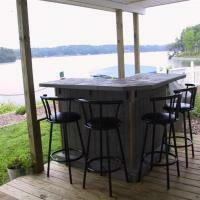 Check out just some of the included home bar designs shown below. 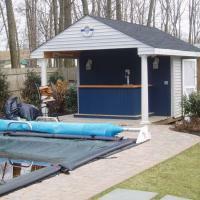 All can be built using weather resistant materials and finishes. 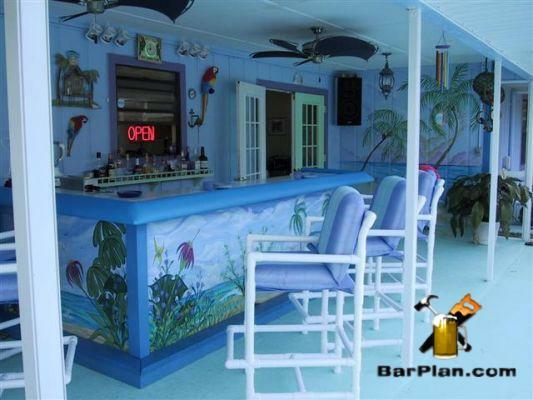 Let's start with the easiest of plans the EHBP-01 Straight Bar design. 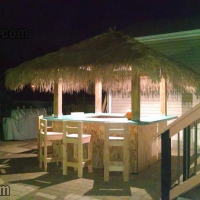 It can be built in one day with one person and a minimal amount of material and effort. It's strong yet lightweight enough to be moved by two capable people. 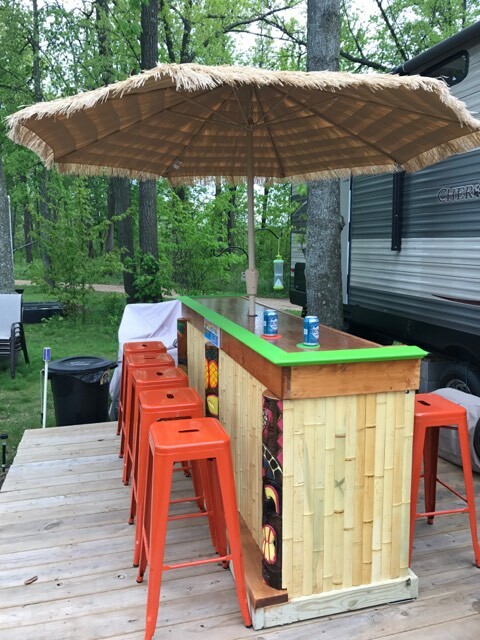 Throw some bamboo facing on the front, add a little thatch and some tiki torches and you've got a great little back yard tiki bar. 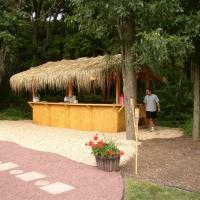 The really cool part of the EHBP-01 if that you can build several for big parties or even weddings. 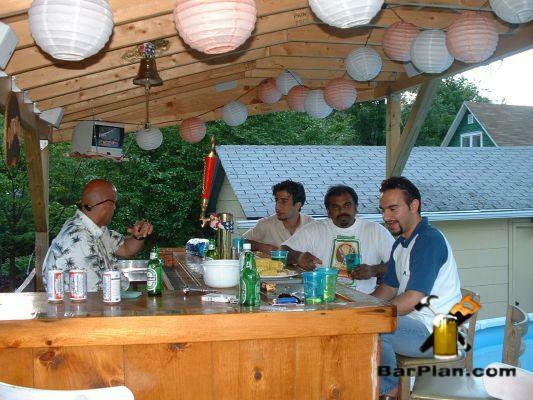 We have a small fleet of them in storage that we rent out or borrow to friends for special occasions. 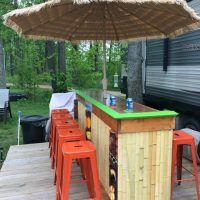 You can start your own bar rental company making a nice little side income from weekends, holidays and other special events. 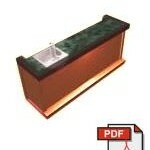 Next is the truly portable EHBP-05 Tailgater Bar design. 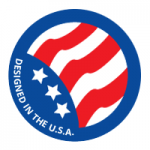 It's slightly more complicated because it is designed to be disassembled for transport. 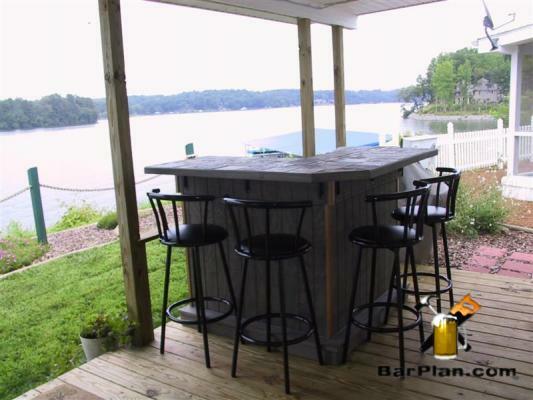 This mini bar is perfect for your deck, porch or patio since it takes up minimal space yet gives you an intimate space to enjoy a few late night candle lit cocktails. The EHBP-05 has a bigger brother, the EHBP-07 L-shaped mini bar which is basically two of the EHBP-05' connected with a portable corner hub. 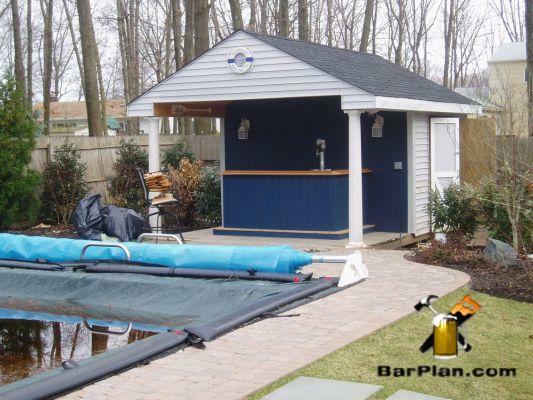 The EHBP-07 is intended to be just an L-shaped mini bar, but by simply building another corner and another mini section, you can have a cool U-shaped bar. 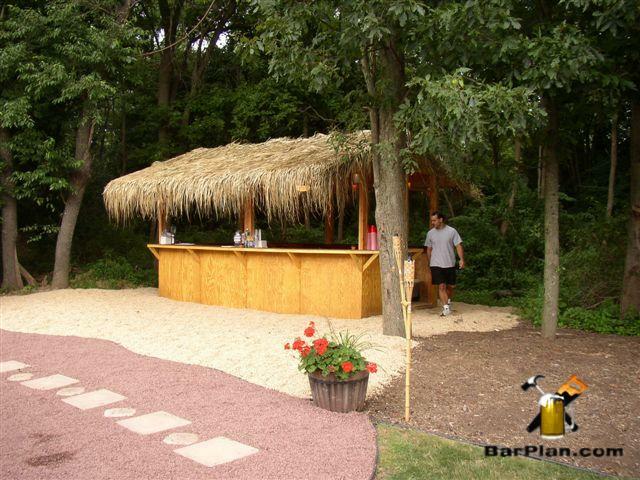 As you can probably guess, this is also great for taking camping or to your favorite sporting event. 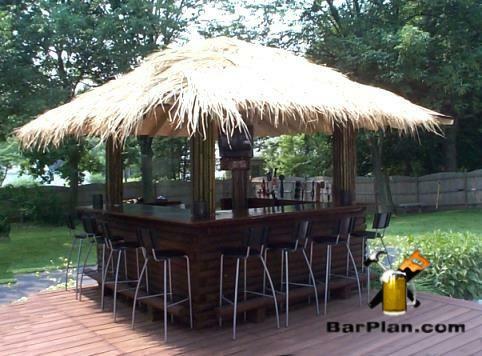 Finally is the king of all backyard bars, the EHBP-20 Party Hut Tiki Bar. 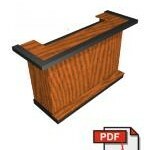 This model is designed to be built on a deck or other solid foundation. like a patio slab. 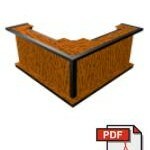 It's gabled roof can be modified as a hip roof if you like. 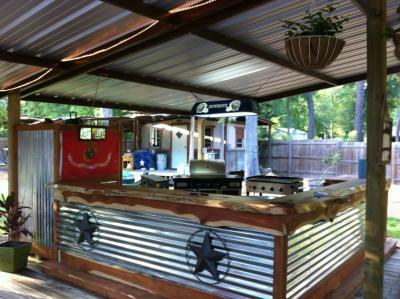 The bar itself include room for a kegerator, fridge and plenty of liquor storage. 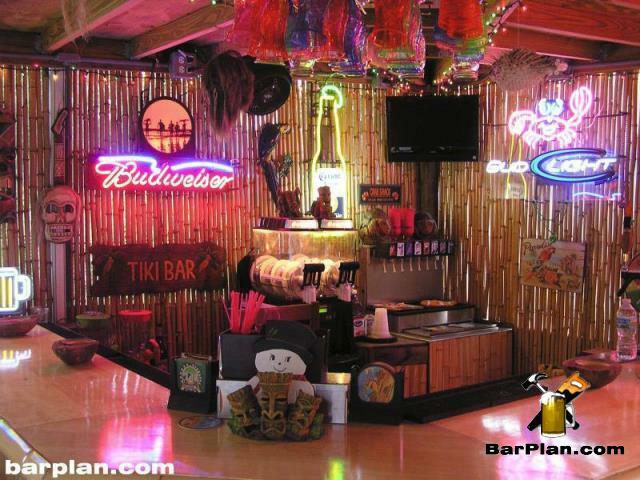 Like any of our core bar designs, this project can be easily decorated to be a cool tiki bar. Imagine the fun you could have with something like this? You'd be the neighborhood "place to be". 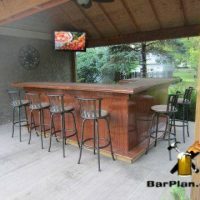 For cold weather regions, at the end of the season, you can button up the area above the bar top using large plywood panels to keep the critters out and even provide a space to store lawn chairs and other backyard items. 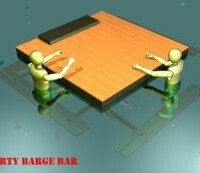 Floating Bar Concept - designed for lake use. 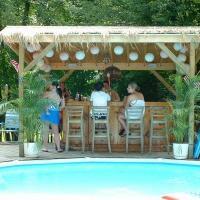 Is that all we offer for summer backyard fun? Pretty much yes, unless your backyard is a swimmable pond, lake or ocean! 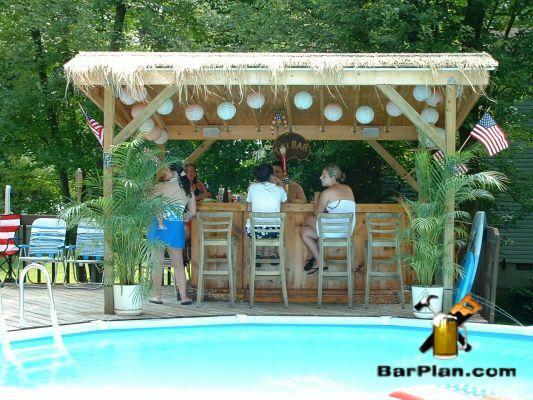 As a goof project dreamed up while floating around on a raft at Eagle River Chain in northern Wisconsin, I designed the EHBP-21 floating swim up bar that is similar to a swim raft except it provides underwater seating and standing areas. 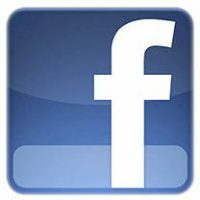 I personally have not built yet, but there have been people interested in this bonus project. 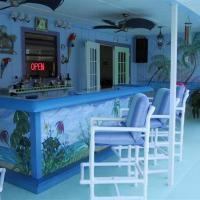 In particular a beach resort in the Bahamas. You can read more about the evolution of this project here. 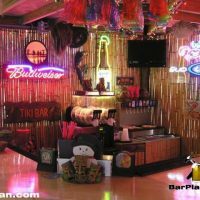 You can view many photos of home bars built using these plans on the respective project detail pages, just click any of the links or images above. Thanks & have Fun!